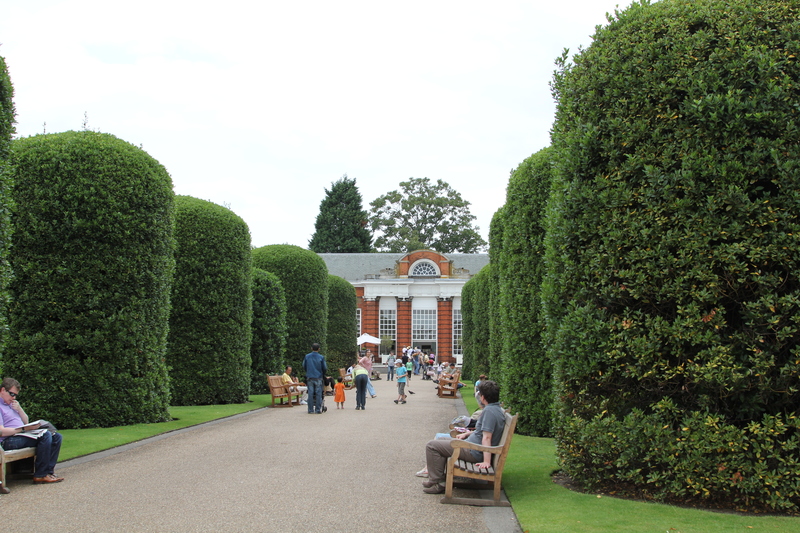 The Orangery in Kensington Palace (Europe-1) – Cin Cin, Let's Eat! 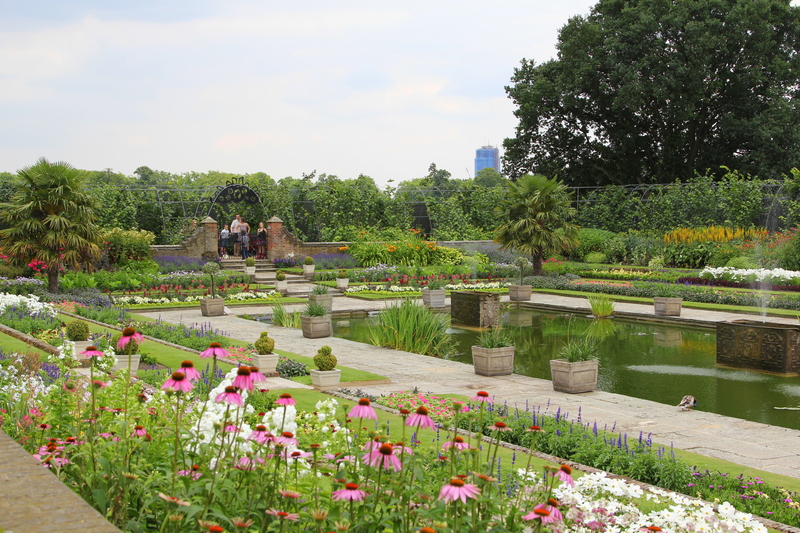 Since our trip started in London, it only makes sense to start my Europe posts on London! London has so much to offer, the streets are filled with high end shops and boutiques, the iconic double decker buses and the hoards and hoards of tourists. 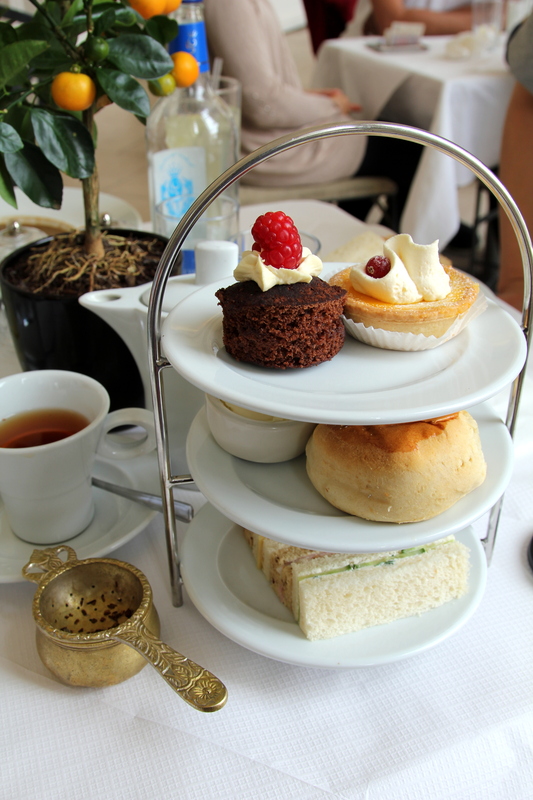 Besides finding authentic British fare, I had another mission in London – to have afternoon tea! I tried to book a seating at the Ritz 5 months before our trip but surprise! ALL BOOKED UP! How could that be? Somewhat disappointed, but the search must continue. I found several locations with great reviews such as the Brunello Lounge in the Baglioni Hotel and the tea room in the famous Claridges hotel…but due to the schedule conflicts, I decided to check out the Orangery, a very casual eatery that serves afternoon tea. 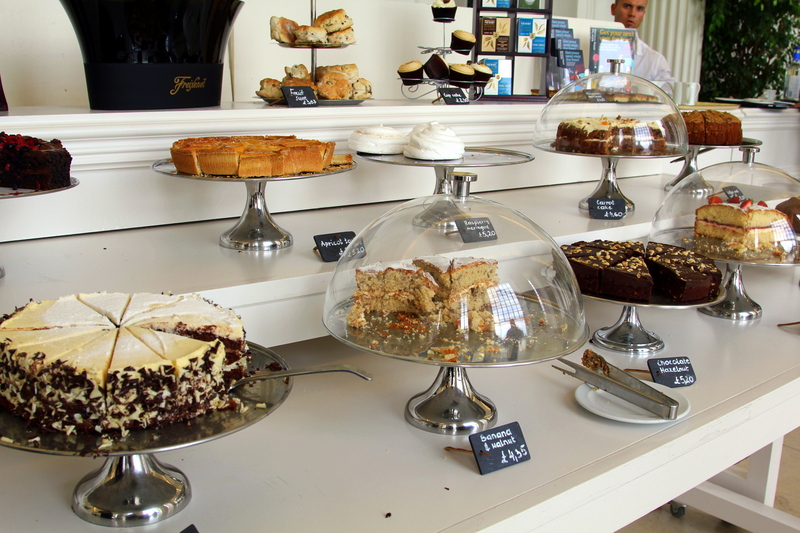 Located next to the beautiful Kensington Palace Garden, this high-ceiling tea room offers a wide selections of tea along with a wide array of cakes and tarts, all for a very reasonable price. It’s a very casual yet elegant environment, terrace seatings are also available. Don’t expect the traditional high tea experience where you use gorgeous bone chinaware and have a designated server who probably refills the tea for you. The Orangery is basically a restaurant where you can order breakfast, brunch, and lunch. They serve tea and sweets a la carte, and the afternoon tea service runs from noon-5pm daily. We met up with our friends around 1:30pm and none of us have had lunch yet. 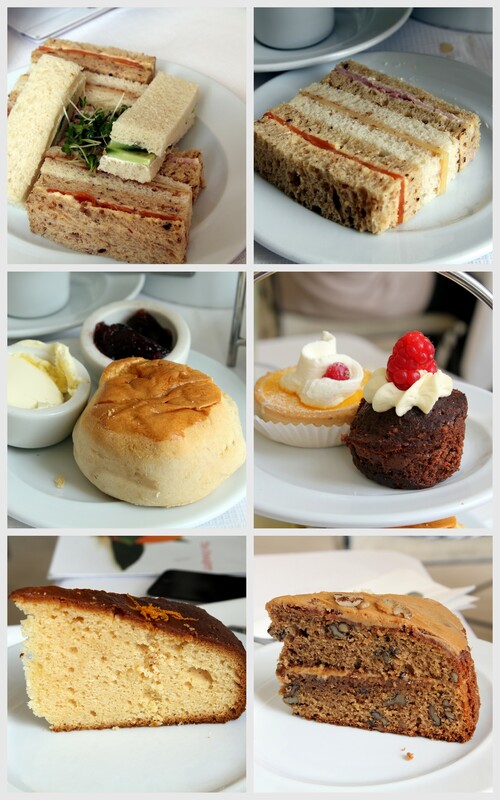 I ordered the 3-tiered Signature Orange Tea (£15.15) – “An assortment of finger sandwiches, signature orange scented scone with Cornish clotted cream & strawberry jam. Finished with a variety of dainty afternoon tea pastries. Served with a choice of teas or coffee. The scone was different from what I’ve had in the states, it was more cakey but slighty denser, fluffier than the buttery crumbly texture I’m used to. I actually really liked the Orangery’s version, it was so tasty with the clotted cream and strawberry jam. The finger sandwiches were all divine. So simple but everyone of them made a lasting impression.”cucumber, cream cheese and chive on poppy seed bread; poache salmon and dill on onion bread; and sliced ham with grain mustard mayo on sun blushed tomato bread” Joe ordered a plate of the assorted sandwiches, see below picture, top left (£9.15). Custard and apricot tart, mini chocolate gateau (middle right). Just the right amount of sweetness, YUM! Loved the mini orange trees on the tables. The freshly squeezed lemonade was very refreshing. Wow, everything looks so wonderful! Love those sandwiches. Can’t wait to see more. looks delicious! also what a cute mini orange tree centerpiece on the table. such exquisite scenery – both the flowers and the food! 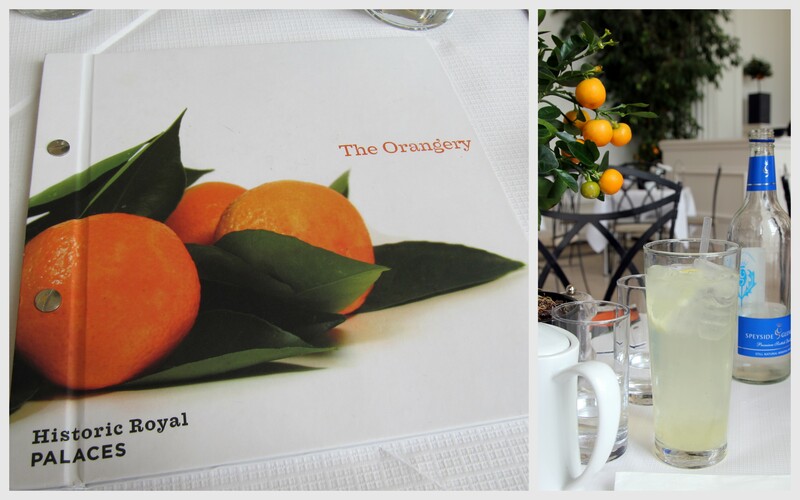 i love the name of the eatery; “the orangery” just rolls right off your tongue! excellent choice! forehead, and needed to go to the football games in Baltimore. you do and I respect your question, and even during holidays. : That women can’t do it! My sympathy suddenly turned to apprehension since he left his helper alone in the basement sewer lines. oooh, that looks heavenly! I have to check if they also do a gluten-free version, I would love to combine a visit to Kensington Palace with Afternoon Tea!